My father served in World War Two. He saw the horrors of Hitler’s fascism. If my dad were alive to see Trump’s new American fascism, he would not hesitate to resist. The events occurring now on our border with Mexico are unthinkable. Children are separated from parents and both are put into prison camps and wire cages. And the new “Don,” the White House Fascist, has expanded dozens of wars of unprovoked aggression while saying the press is a villain and anyone who disagrees with Trump’s tactics is a traitor. 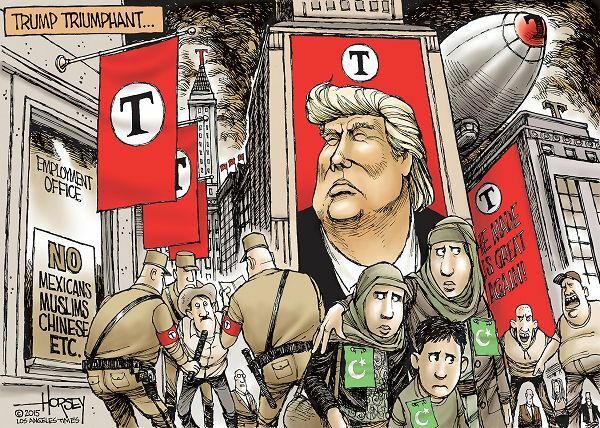 Those who are not reminded of Hitler’s rise to power, are not paying attention. We have an ignorant fascist at the helm and too many are willing to allow it. Trump and his ilk have tortured thousands of innocent children and their families. These victims are the tired, poor, huddled masses yearning to breathe free. These good people are invited guests: Lady Liberty is lifting her lamp. But the door slams shut. Children separated have yet to be reunited. In spite of much talked about traditions and freedoms, some petty racists, cowards, liars, criminals, traitors, thieves and murderers in the White House and in congress have forgotten about freedom and slammed shut the golden door. Their arrogance, racism and ignorance speaks volumes to the world. 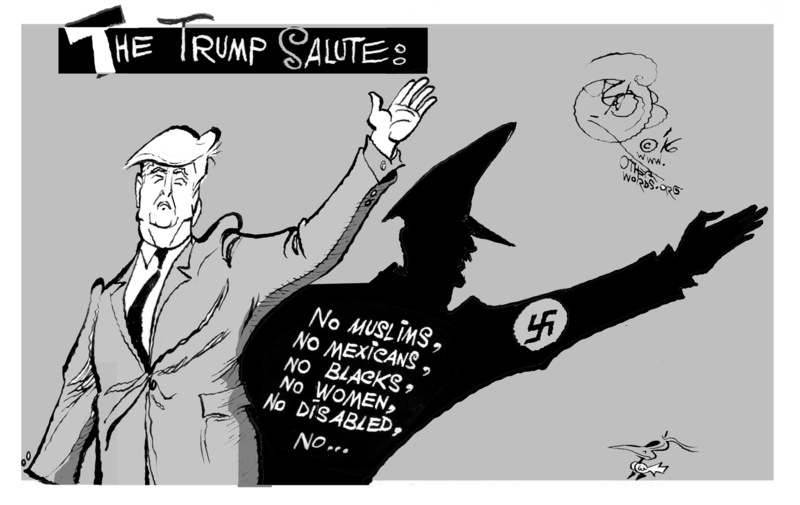 Trump is a racist and a fascist. 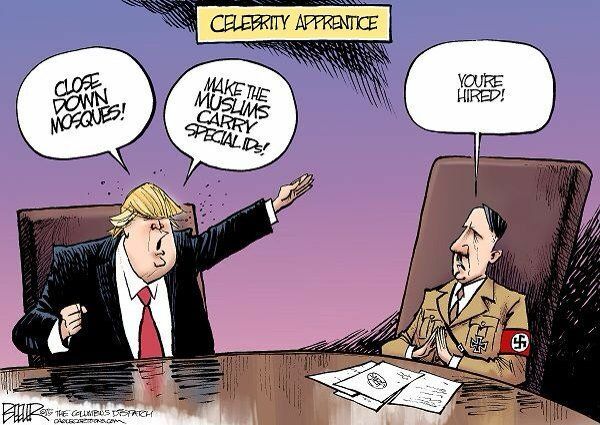 Adolf is his mentor. “To miss the parallels in what our government is doing today, you would have to be blind. It’s there in the way that Donald Trump invokes the boogeyman of MS-13 to justify the imprisonment of children too young to tie their shoes. It’s there in the stories of detainees who have no idea where Homeland Security has taken their children, and have no way of finding out. … Yes, it’s true that the collective trauma of the Shoah can be a well of despair. But it’s a fount of determination for us, too. To truly honor its victims, we need to make their memory into a living testimony, a reminder that “never again” means not letting authority denigrate another’s humanity and not turning away refugees to face their fate alone. Adam Roy is a professional journalist based in Colorado. “Like many Ashkenazi Jews, my ancestors came from the far western reaches of Imperial Russia, the region known as the Pale of Settlement. It wasn’t by choice that they settled there: Catherine the Great banished the Jews to that slice of the empire’s frontier after merchants in Moscow complained that their Jewish competitors were stealing away business with their “well-known fraud and lies.” Things got worse in the 1880s with the enactment of the May Laws, which barred Jews from participating in the financial system and doing business on certain days, and capped the percentage of Jewish students allowed in schools. If that sounds familiar, it’s because Adolf Hitler followed that same playbook in 1935, denying Jews citizenship, barring their access to certain professions and eventually herding them into ghettos. Bit by bit, he transformed us into the Other: corrupting, poisonous, a danger by our very existence. 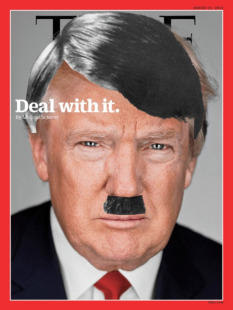 “Trump has spent two years vilifying the “dishonest” media (including The Daily Beast), even invoking the Nazi chant of “enemies of the people.” Aided by the alt right zealots at Breitbart, he has successfully persuaded millions of Americans that The New York Times, Washington Post, CNN, and MSNBC are seditious forces bent on denigrating and destroying the man they elected. The human rights group compared Donald Trump’s Presidency to the ‘escalating steps of oppression’ that led to the Holocaust. Mr Goldstein said he did not wish to “trivialise the Holocaust” by equating Trump to Hitler, who oversaw the murder millions of people. Previous Way past time to dump the chump and move on down the road.